In the Psalms the word selah comes up every so often and is variously interpreted as meaning a pause to reflect on what has gone before and an expression of praise or worship to God. So when working on a new idea that is a kind of ‘Mini Prayspace’, “Selah – a pause with God” seemed to be just about perfect. -We had been asked to develop a kind of ‘interrim’ Prayspace – something that would not be a whole room for a whole week but would be small-scale, once a term, continuing to build on the impact of annual Prayspace weeks. -Whilst still encouraging staff to visit the ‘main’ Prayspace room, what would happen is we developed something that was just for them, left in the staff room during annual Prayspace weeks? -Could we combine the two? The idea is of putting together a ‘cabinet of curiosities’ – a piece of furniture that is intriguing and beautiful in its own right and contains a few simple prayer activities. The thought was that it could be left in a library for a couple of weeks, available for use when the library was open and staffed, with BCY staffing it for a couple of lunchtimes a week for the duration of its stay. If we then wanted to use it during Prayspace weeks for staff we could dress it slightly differently and use it that way, too. I am fascinated to see what kind of feedback I get from this week. I checked in today and several people have already used it, which is great! There are a few more images here if you’d like to see them. -The cabinet is Ikea, found for £20 on Gumtree and then painted, waxed and distressed using Annie Sloan paints and waxes. -Bean bag cubes, rug and LED candles from Dunelm Mill. -Flag-shaped post-its, cardboard boxes, kraft paper, mini pegs all from The Works. -Bauble lights from Home Bargains. -Brown paper luggage tags from eBay. Things may have been a bit quiet on here, but we’ve still been beavering away at making the best prayer spaces we can in our local schools. Life can be puzzling – ask God for wisdom because he promises to give it. I am now trying to have at least one take away element to all our spaces to extend the reach of the prayer room beyond the praye room! This activity encourages students to take their puzzle piece away as a prayer prompt for the rest of the day. Try The Works for cheap-ish puzzles. If you don’t know what you’re doing, pray to the Father. He loves to help. You’ll get his help, and won’t be looked down on when you ask for it. Ask boldly, believingly, without a second thought. Who would you like to ‘flag up’ with God? Write your prayer on a triangle of paper and help to create ‘bunting’ that is covered in prayer. If God could do one miracle for you today, what would it be? We covered the back of an old pallet with chicken wire (health and safety conscious as ever…) and then backed that with hessian. It certainly looked rustic! This meant we had a ready-made grid so that students could roll up their prayers and push them in – wailing wall style, I suppose. This has the added bonus that their prayers are both anonymous and private, unless they choose to tell someone about it. We also have a Bible open to Mark 10 when Jesus asks Bartimaeus ‘What do you want me to do for you?’. Whenever I run a Prayspace week I ask if I can have assembly slots before / during / after / all three (!). It helps set up the week, advertise what’s going on, generate some buzz.. and best of all. it allows opportunity to follow up in a school-specific way. Whilst I have a couple of ‘Pre-Prayspace’ assemblies in my back pocket, I never plan the assemblies for ‘Post-Prayspace’ until at least the middle of a Prayspace week. There is a great immediacy that comes from seeing which activities, ideas, concepts or themes the students and their interactions with the prayer activities begin to highlight as the week progresses. Having spent the last week running Prayspace at King Edward VI Upper School, the clear stand out activity from the week was Forgiveness Stones. So this week I have been doing assemblies in school, asking, ‘What does forgiveness look like?’. It uses some of the script from the Forgiveness stones activity and then goes on to develop the students’ thinking about what it means to offer forgiveness that is real, true, deep, free and full. As forgiveness is something we do, not just something we talk about, I wanted to take a bit of a risk and encourage students to perform an action that would help them to respond in a meaningful and personal way. I arrived early and placed an A6 piece of coloured paper on each chair in the assembly hall. Throughout the assembly, students are encouraged to look at their piece of paper and let it become for them a specific hurt done to them, or that they have caused someone else. They can leave it behind – knowing that they will probably need to deal with it at some point. It’s out of sight, but it’s still there. They could take it with them – knowing that, although the piece of paper that represents their hurt is flimsy, they are basically choosing to carry a toxic box of bricks away with them. They can stick it in the shredder by the door – knowing that they are choosing to forgive, or at the very least take a first, proactive step on the path towards forgiving. What does forgiveness look like? It might, on this occasion, look like a shredded piece of paper. Wonderfully, the shredder cross-cuts the paper into a kind of confetti, transforming the ‘hurt’ into something that we see joyfully floating on the breeze at times of celebration. Evil can be defeated. Good overcomes. 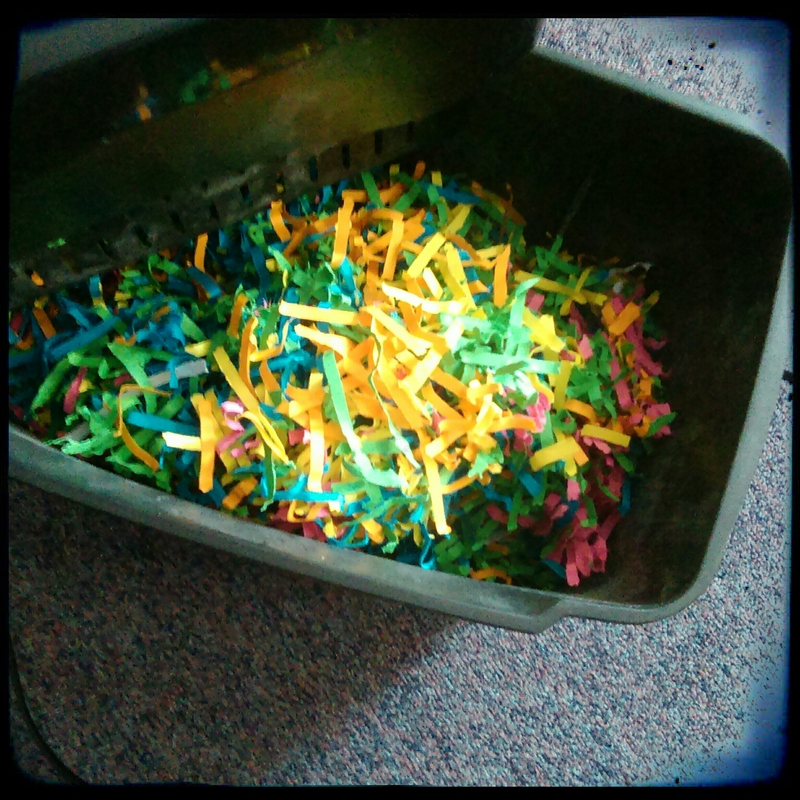 It was really quite moving to see the queues of students waiting to use the shredder at the end of the assembly on all three days this week – and to pick up a shredder full of brightly coloured confetti at the end of the last assembly of the week! One of the things we always find students doing in Prayspace is praying for or to their dead relatives. Whilst this is not something we encourage, it has certainly flagged up to us repeatedly that we need to find a way to directly and sensitively engage with the thoughts, feelings and reality of loss and grief. Finding a way of approaching this felt all the more appropriate in our Christmas-themed Prayspace, as it is often at times of celebration that we notice someone by their absence. The chair they would usually have filled is left vacant. This idea of The Empty Chair seemed like a strong visual so we worked up the prayer station from there. We wanted the prayer station itself to look really special. To that end we used various bits of lighting rig (that we usually use to form the ‘Be Still’ tent) and made an enclosed booth from black sheets. We used some voile for fabric doors to give privacy but also to allow for safeguarding appropriateness. We then spotlit the chair. The Head of Humanities brought in a lovely rug to put on the floor, which was a great addition. It was a small piece of theatre, really, and it looked great. To give students a simple way to remember someone we provided luggage tags for them to write a name on, which they then tied to a really lovely antique chair (borrowed from an equally lovely Trustee, who herself had inherited it when her mother-in-law died). 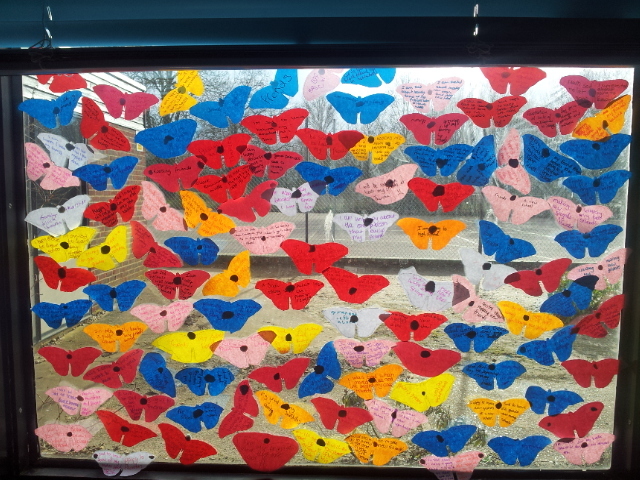 The info panel encouraged students to think of their favourite memory of the person and to give thanks for it, and also to talk to God about their feelings if they wanted to. We also wrote a very simple poem which sat on the chair for people to read as they took a moment to think of someone. We limited the activity to just two at a time. During the intro to the room we made a very definite point of saying that grief and sadness are not weird or strange, but completely normal, natural and important. 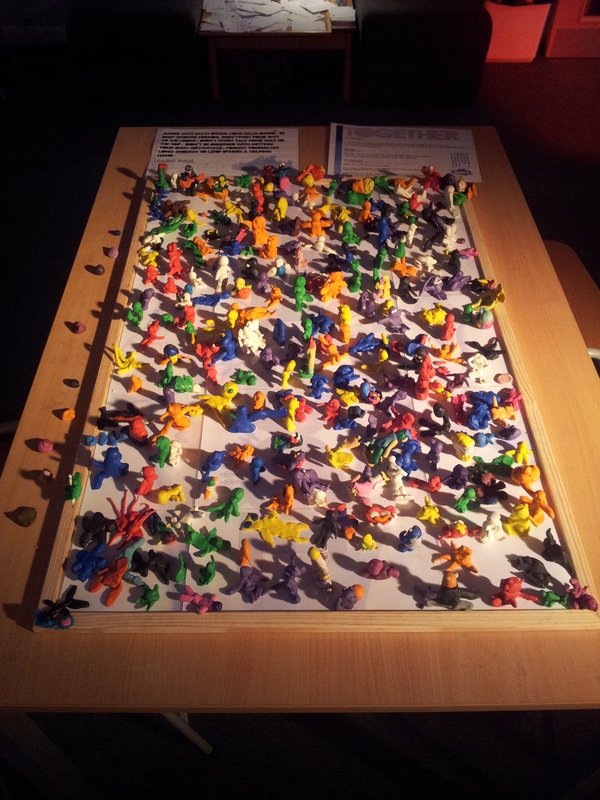 We emphasised that Prayspace is a safe space. If they felt the need to cry that was absolutely fine – and much better than bottling it all up inside where those feelings can do more harm than good. It was very moving and humbling to see students released to express their grief – some of which was very recent and raw. On reflection, perhaps the most important thing was to give students the permission to express their sad feelings. It’s not something that is done very often, it seems. Some students sat by themselves, some with a friend, some wanted the company of a staff member or a Prayspace Guide. We had some very brave and emotional students give some beautiful feedback in the group debrief in the room at the end of the sessions. In addition, a number of the comments in our visitors book were about how helpful The Empty Chair was, and how much they appreciated the support of the Prayspace Guides who sat with them, talked to them or just handed them a tissue (make sure to have some on hand if you use this idea!). Let me know what you think, suggestions on how to improve it or how you get on if you try it! We managed to black out the room (as you can see) and we turned out all the lights once the students were seated. After we had run through the script, we introduced the different stations very briefly, turned the lights on and the students had free time. The Empty Chair was particularly effective – there will be a separate post for that one with the info panels etc. included very soon. Really interested in any feedback as always! I so often get asked what a prayer space looks and feels like. The best way to know is to visit one. The second best is to go here , where there is a quick video tour of our latest Prayspace at St James Middle School. Hope this helps! We’re not (re)inventing anything here. The roots of creative prayer grow down deep into various traditions of church. They’re not new. They don’t actually change the nature of prayer itself. If prayer is communication with God (speaking and listening), then we need to find ways that we can do this most effectively. Engaging our senses, providing focus and stimulus to prayer of various kinds, carefully considering the environment to make it easy to talk / listen… they’re all things that help and encourage effective prayer in my experience and in the experience of those who have tried to walk closely with God over the many years before me. We’re not trying to ‘make prayer modern’. What we do is not the future – it’s the ‘present’ of prayer in much the same way it has been for a long, long time. We’re inviting people to communicate. Prayer can be spoken out loud. Prayer can be incense and candles. Prayer can be in the silence of the heart. Prayer can be sung. Prayer can be drawn, sculpted, written, stuck, tied… If prayer truly is communication with the Living God, it should NOT be inaccessible, irrelevant or boring! Prayspace aims to invite students to discover that there are many ‘languages’ of prayer that will enable communication to flow easily. One of the prayer stations we have developed over the last year or so is called ‘Together’. It’s a reflection on community, identity, and self-perception. Working in pairs, students make a model that represents their partner (does not have to be a literal person – maybe they are helpful so they make a hand, or compassionate so they make a heart etc.) As they make their models, they are encouraged to reflect on how they see themselves, how others see them and how God sees them. They have a 3 minute sand timer that they turn over twice to keep them from spending their whole time playing with plasticine (which, let’s face it, is pretty fun!) It works well with middle and upper school students. I wandered over as she was explaining it to her friend. “I don’t want to get all soppy, but our friendship’s beautiful and we have a really strong bond”. I challenged her use of the word soppy – that, in fact, is a very moving and personal thing to say! I wondered how often had she actually said this to her friend about their relationship? She welled up a little. They shared eye contact and a smile. It was a lovely moment of connection and real communication. Doubtless these girls Facebook, text, speak on the phone, Tweet, Instagram etc. but it was so great to see plasticine cut through all that and enable someone to express the value of a friendship in simple, honest terms. I always hum and har over whether to keep using this activity (it’s not really prayer, is it…?). But it continues to be an activity that brings about some very important and meaningful revelations for students. Very excited about how our cloud of images from Prayspace past and present is growing over on Flickr. The link is on the Gallery tab, but here’s an extra nudge of encouragement to head on over. These images really do say a thousand words. And here’s the text for the information sheet. As always (with the exception of the Prayspace logo / ‘branding’) feel free to steal or adapt if you like!